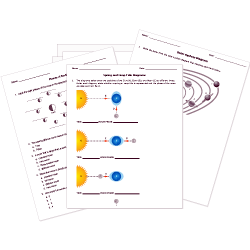 You can create printable tests and worksheets from these Astronomy questions! Select one or more questions using the checkboxes above each question. Then click the add selected questions to a test button before moving to another page. Gravity on the Moon is the gravity on Earth. Every object revolves around the Sun in a path called a(n) . Change of season is mainly due to the revolution of Earth. The path an object takes as it revolves around another object in space is called . Object "A" is a(n) . What is found at the center of the solar system? 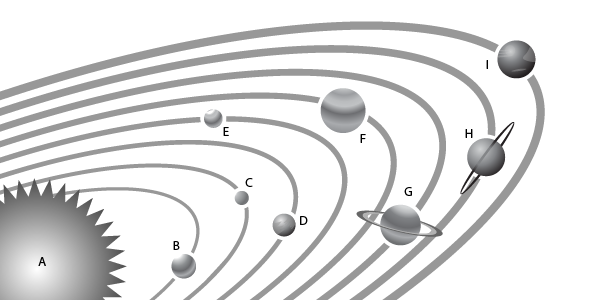 Which of the following is closest to the center of the solar system? is the fifth and largest planet in the solar system. The is a huge rock that does not have its own light. is the only planet known to have living things on it. One year on Earth lasts 365 days. Which of these definitions could be used for one year? The time it takes for Earth to go around the Sun once. The time it takes for the Moon to go around Earth 12 times. The time for Earth to spin once on its axis. The time for the Moon to complete all of its phases. The center of our solar system is .